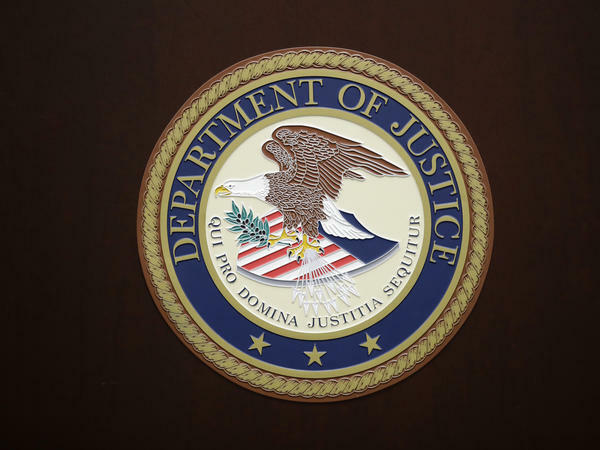 The U.S. Department of Justice logo is seen on a podium in Baltimore, last year. The Associated Press writes, "Ji made an initial appearance in federal court in downtown Chicago, looking tired and fidgeting as he stood before U.S. Magistrate Judge Michael T. Mason. Ji huddled with a Chinese-language interpreter for much of the 15-minute hearing. But when the judge asked if he understood his rights, Ji lifted his head and said in English, 'I understand.'" Ji, who was living in Chicago, allegedly worked at the direction of a high-level intelligence officer within the Jiangsu Province Ministry of State Security, a provincial department of China's Ministry of State Security. Ji was "tasked with providing the intelligence officer with biographical information on eight individuals for possible recruitment by the JSSD," according to a Department of Justice statement. The criminal complaint says Ji first arrived in the U.S. in 2013 on a non-immigrant student visa to study electrical engineering at the Illinois Institute of Technology in Chicago, earning a master's in electrical engineering in 2015. In the process of applying for MAVNI, Ji submitted a security clearance form on which he answered "no" to a question about contact with foreign governments or representatives, the complaint said. Later, in an interview with a U.S. Army officer, Ji also failed to disclose his contact with the Chinese intelligence officer. "All eight individuals either currently worked in or were recently retired from a career in the science and technology industry, including several individuals specializing in aerospace fields," the complaint reads. It adds, "at least seven of the eight individuals worked for, or had recently retired from, cleared U.S. defense contractors."